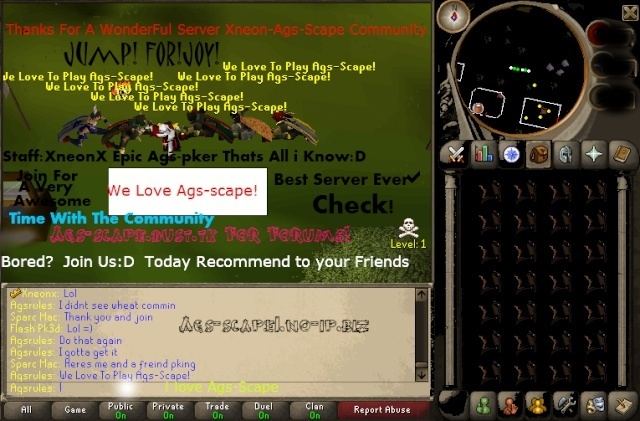 About me: im currently not going to school i have a full time job as a brick layer, when im at home im on ags-scape when im not on ags-scape im with my mate in town or something. Why i think i deserve co owner Status: Im allways willing to help people, im allways online, respect other staff and the owner and all players, willing to help make the server better for other players help with coding or anything u need. What will you do when you are co owner: I would thank the owner for trusting me with the job and than do what ever need to be done. Have you ever been staff on other servers: Iv been staff on (pkpickup.no-ip.biz-mod) (carebearscape.no-ip.info-mod&admin) and im head admin on (ags-scape.dust.tv) right now. Will i advertise for the server: Yes i would id help make vid make my own vid's maybe even make a phote bucket about the server and everything in it. Will i vote everyday: I vote every day and i will every single day. You should get co-owner. You're a very understand, co-operative staff member and I know you'd be a great co.